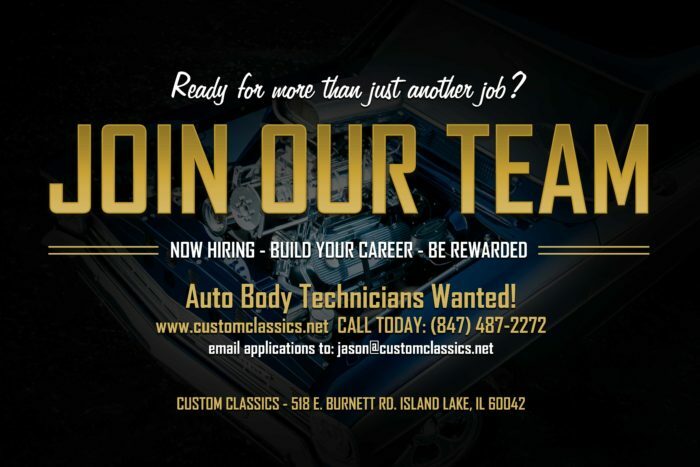 We are a busy and growing classic car restoration and auto body shop in Island Lake, IL and we have an opening for a full-time Auto Body Technician – WITH SIGNING BONUS! Overview: Here at Custom Classics in Island Lake, IL, we specialize in classic car restoration, custom car building, and collision repair (including classic & exotic cars). The Auto Body and Restoration Technician is responsible for repairing all assigned vehicles. Damaged vehicles should be restored to pre-accident condition following the written repair order. Classic cars should be restored to like-new condition following the written repair order. The Body and Restoration Technician plays a key role in delivering on Custom Classic’s promise of speed, quality and customer satisfaction. If this describes you, then this could be a rewarding career for you. You would work in a friendly environment with like-minded technicians. We offer competitive pay and room to grow within the company. You would be working with a group of really good, friendly, and skilled people – so of course, we expect you to be the same. The huge variety of vehicles we repair, build and restore make it a very exciting and fun place to work. OPENINGS FOR FULL-TIME POSITIONS. APPLY TODAY IN PERSON! If you are interested, please stop by our facility for an interview and to fill out an application. Please, no painters, just auto body and classic car restoration techs.